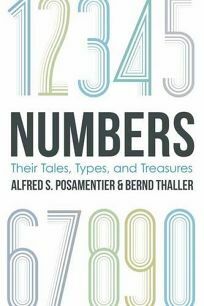 Won't have time to write a full review, but will recommend Alfred Posamentier's (with Bernd Thaller) latest book, Numbers: Their Tales, Types, and Treasures." It's a typical Posamentier offering... clearly written and organized, without oversimplifying or dumbing-down the wide-ranging material; some interesting and fun things mixed in with historical and classic material. I enjoyed the second half of the book, and especially the last few chapters, more than the first half with its focus on history (for whatever reason, math history, pre-1800 has never much held my interest). Again it is a great refresher for some adult math enthusiasts and an especially good read for the young person already inclined toward mathematics. The book is a nice compendium of amusing problems with varying difficulty; a little more challenging mix than often found in standard puzzlebooks. 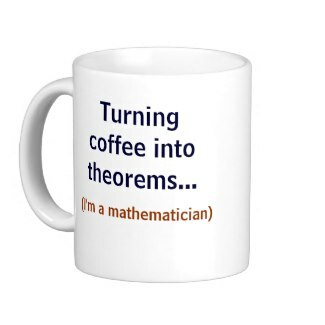 However, only about a quarter of the problems are strictly mathematical. The remainder are more physics-related (though often, of course, still requiring math), so for someone with little interest in physics this may not be a good book choice. 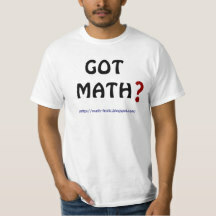 Luckily, most math fans probably enjoy physics as well, and young, budding physicists should definitely enjoy. "Over dinner once I was told what I believe is a true story about the principal of a Cambridge college taking out a calculator to multiply a number by 100. In a rare moment of lucidity I quipped, 'was it a difficult number that was being multiplied?' Only the scientists got the joke." Anyway, you get the idea, in-between the puzzles are some entertaining bits. Captain Fishmonger goes on a treasure-hunting voyage. He arrives at the deserted island for which he has a treasure map showing just two trees and the instructions, "Walk 50 paces from one tree AND also 50 from the other. There lies the treasure." But as Fishmonger peruses the island he finds that in the time since the treasure was buried and the map drawn, now 14 more trees have grown up. There are now 16 trees all less than 100 paces from one another. In the WORST CASE scenario, what is the MAXIMUM number of spots the Captain will need to dig to find his treasure?
. answer: 240 ...drawing 50-pace circles around any two tree-pairs gives you TWO possible digging (intersecting) points, and combinatorics can be used to calculate the total number of possible tree pairings (120). 2 x 120 = 240 as maximum number of digs required. ...and Sunday here I'll be recommending a couple more recent books, so do come back then. These pieces focus primarily, not-so-much on the quality, integrity, or analysis issues (which are significant themselves) of research studies, but on the issue of generalizability: how far out (or how big a population) can the results of a given study really be applied to? This is especially an issue for "social" or "soft" sciences. And the generalizability problem in turn touches on the even broader issue of "induction" in science. Previous work has focused on the "WEIRD" study samples employed in much western research (subjects drawn solely from a "Western, Educated, Industrial, Rich and Democratic" population pool; hardly a random sample). This deserves a longer post, but I don't have time. I'll just say that people like to discuss "science" as if it were some monolithic practice, when in fact inherent differences reside between various fields of science: psychology, biology, medicine, anthropology, physics, engineering.... (there are even huge differences between practitioners WITHIN any given field!). Science is a continuum (ranging from excellent to good to average to mediocre to poor to piss-poor! ), there is NOT some clean binary science/pseudoscience division; plenty of published science barely ranks above pseudoscience, if critically adjudged. Even though I was a psychology major, I rarely saw psychology research that I'd hold up as good science. As recently as this year I took part in a psychology study under a well-funded, fairly well-known researcher (and author)... that I believe was essentially junk science (as commonly funded by the likes of NIH -- and to those who shudder every time NIH's funding is threatened, I have to wonder how you regard your own research... because chaff (of which there is plenty) is what is intended to be cut from the NIH budget; if you're doing excellent research you have little to fear from such cuts, but if you're just publishing-or-perishing for the sake of publishing-or-perishing pressures, well.... Anyway, enough soapbox, take a gander at the Bloomberg and Siegfried pieces (especially the latter). I've never read an Amir Aczel book that I didn't more-or-less enjoy, BUT I've also never read an Aczel book that left me wanting to rush out and recommend it to others. I enjoy Aczel's books in a kind of ho-hum sort of way, but not an enthralling sort of way. 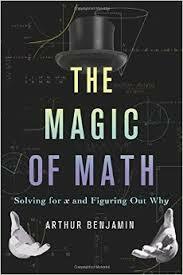 I say all that because I had the same reaction reading Arthur Benjamin's new popular math volume, "The Magic of Math." It's certainly an okay book, and indeed arrived with a long set of glittering endorsements from very reputable folks... but I almost felt like they'd read a different book than I had when they use words like dazzling, playful, joyful, fun, delightful, magical, etc. to describe it over and over. Many, perhaps most, readers know Benjamin from his online presences, where I think those words might more aptly apply, but this volume didn't seem that much above-average in such qualities. There is SO MUCH popular math available these days in book form that it is difficult to write ANYthing very original or exciting anymore (and yet people do -- for example, Jordan Ellenberg's injection of wit, creativity, and humor into his 2014 "How Not To Be Wrong" volume elevated that book well above the crowd, and Alex Bellos regularly manages to approach well-worn topics in clever, engaging ways). The first five chapters of Benjamin's offering, with discussion of some basic math, patterns, algebra, some combinatorics, and a whole chapter on the Fibonacci sequence, slightly bored me, though if you're unfamiliar with that content or Benjamin's video work, it may well be more interesting for you. It isn't that the material is covered badly, but simply that the material has been covered so many times before by others, and I didn't find Benjamin's treatment that superior to prior efforts. In parts of the book, Benjamin drops his hints/tricks for mentally computing faster or more easily. This is perhaps what some will view as "fun," though I find it a bit formulaic or dryly recipe-like. The volume picked up (for me) with chapter 6 on "the magic of proofs" followed by chapters on geometry, pi, trig, i and e (perhaps my favorite chapter), calculus, and infinity; a progression of deeper, weightier topics, although again there wasn't that much in Benjamin's presentation setting it above others. The chapter on calculus is a nice, straightforward textbook-like introduction to basics of differential calculus. It all makes for fine (if slightly pedantic) adjunct reading for a middle or high school student already inclined toward math; I'm just leery of how enlightening or fun this volume will be for the greater mass audience it claims to be targeting. The book also contains numerous "Asides" in gray boxes where the author sidetracks to briefly highlight some matter tangentially-related to the main discussion -- in the Intro to the book Benjamin writes that the reader may skip these 'Asides' (if s/he so chooses), as being unnecessary to the main text. That may be true, but I actually found the 'Asides' to be the most interesting parts of the volume, so I recommend the reader NOT skip them! Also on a positive note, the visual presentation, layout, illustrations, and organization of the book are excellent, and if the text had had a bit more pizzazz I'd rate it higher. As it is, I enjoyed the book, and for the right reader it will serve well, but for the broader reading public there are more scintillating math picks. It will easily merit an honorable mention in my year-end favorites-list, but probably won't crack the 'top 10' for the year. Worth noting, for those seeking more of a challenge, that Benjamin (as co-author) has another volume already out this year, "The Fascinating World of Graph Theory" that is likely quite good on that particular topic, though I haven't read it.